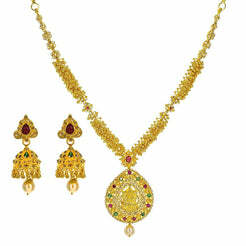 22K Yellow Gold Antique Temple Necklace W/ Ruby & Emerald on Large Winged Double Laxmi Pendant for women. 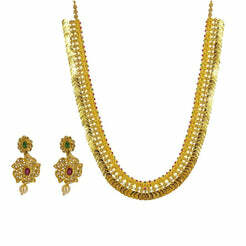 This one of a kind necklace is embellished with rubies and emeralds. It features a fascinating pendant with double Laxmi accents and carved peacock details along the chain. It is 33" long with a width range of 2-20 mm. The pendant is 96 mm long and 104 mm wide. 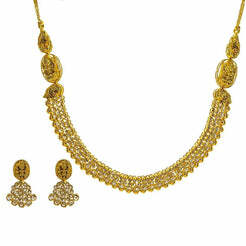 It weighs 160.4 grams and will be the ultimate finishing touch to your traditional attire.